in The Cursed Child a magical creature called the Augurey is used as an important symbol. (I'm talking here about the bird itself, not the character who becomes identified with it). We get a brief description of the bird from Delphi, but I'd like to know more. I did a bit of googling, and it seems like the creature is a pure Harry Potter invention. Does it come up anywhere else in the canon? Is there anymore information about it? It seems quite interesting, it's just the characteristics of the bird are not the most pressing thing when it is described in the play. Out of universe, too, if it is pure Harry Potter, do we know what it was based on? And was it invented for The Cursed Child, or has it been about before? The Augurey is a native of Britain and Irleand, though sometimes found elsewhere in Northern Europe. A thin and mournful-looking bird, somewhat like a small and underfed vulture in appearance, the Augurey is greenish black. It is intensely shy, nests in bramble and thorn, eats large insects and fairies, flies only in heavy rain and otherwise remains hidden in its tear-shaped nest. The Augurey has a distinctive low and throbbing cry, which was once believed to foretell death. Wizards avoided Augurey nests for fear of hearing that heart-rending sound, and more than one wizard is believed to have suffered a heart attack on passing a thicket and hearing an unseen Augurey wail. Patient research eventually revealed, however, that the Augurey merely sings at the approach of rain. The Augurey has since enjoyed a vogue as a home weather forecaster, though many find its almost continual moaning during the winter months difficult to bear. Augurey feathers are useless as quills because they repel ink. There's also a footnote remarking that noted loon Uric the Oddball kept about 50 pet Augureys, and subsequently went a little... odd. 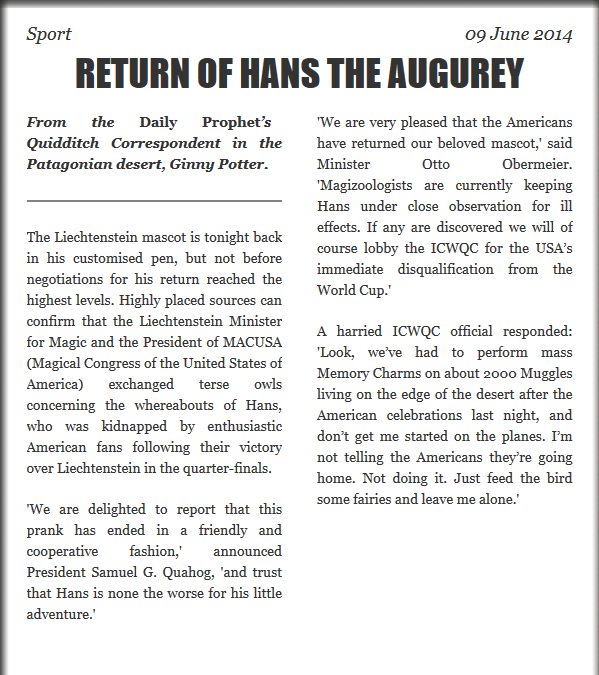 This appears to be the only other information about Augureys in canon, although as ibid extensively cites, they were referenced a handful of times in Quidditch World Cup material on the old Pottermore; an oversized Augurey named Hans was the mascot of the Liechtenstein national Quidditch team. Her mission is to give warning, by a plaintive wailing cry, of the near approaching death of one of the family, and this cry is repeated at the moment when the soul leaves the body. [...] The spirit is generally heard at night, sometimes at midday, and very rarely in the mourning. The mournful cry is generally the only indication of her presence, but in a few instances she has been seen for a moment as a rapidly receding figure having the appearance of a withered old woman clad in flowing white drapery. Rowling, of course, actually included banshees in her story, though they bear little resemblance to the banshees of myth; Rowling's banshee appears to be a mashup of the mythological creature with the pop-culture image of the shrieking woman. As Neeshka notes in a comment on the question, "augury" is a form of divination, originating in ancient Rome, that interprets omens by observing the flight of birds. Europe. A thin and mournful- looking bird, somewhat like a small and underfed vulture in appearance, the Augurey is greenish black. It is intensely shy, nests in bramble and thorn, eats large insects and fairies, flies only in heavy rain, and otherwise remains hidden in its tear-shaped nest. feathers are useless as quills because they repel ink. 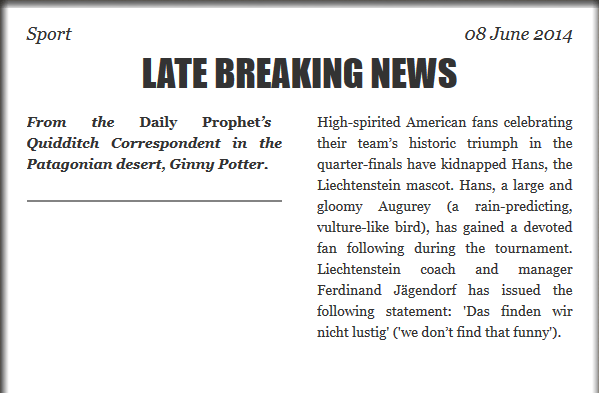 In addition to the entry in Fantastic Beasts and Where To Find Them, an Augurey also appeared several times on the old Pottermore, in four of articles involving the 2014 Quidditch World Cup. Liechtenstein caused a serious upset in the qualifying stages by winning the group over China, the runners-up in 2010. Liechtenstein’s team mascot is a gloomy, oversized Augurey called Hans who has his own fan club. High-spirited American fans celebrating their team's historic triumph in the quarter-finals have kidnapped Hans, the Liechtenstein mascot. Hans, a large and gloomy Augurey (a rain-predicting, vulture-like bird), has gained a devoted fan following during the tournament. Liechtenstein coach and manager Ferdinand Jägendorf has issued the following statement: 'Das finden wir nicht lustig' ('we don't find that funny'). Once on the ground, the teams embraced in a heart-warming show of sportsmanship. 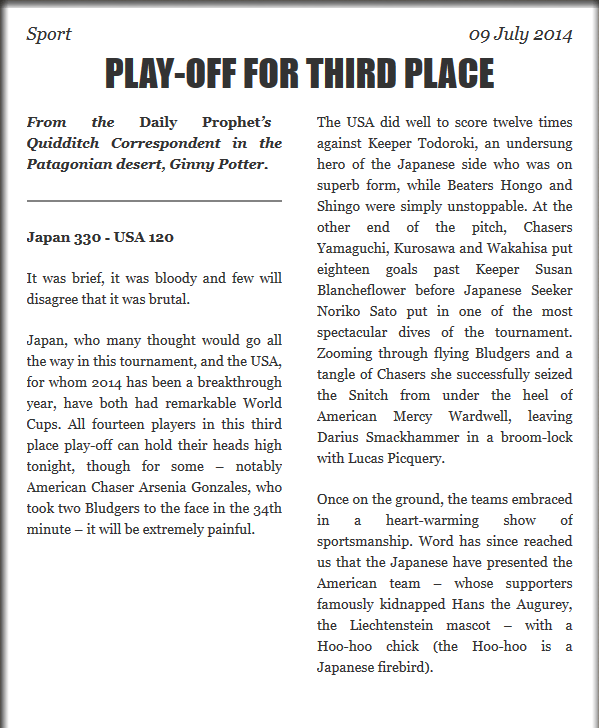 Word has since reached us that the Japanese have presented the American team - whose supporters famously kidnapped Hans the Augurey, the Liechtenstein mascot - with a Hoo-hoo chich (the Hoo-hoo is a Japanese firebird). Not the answer you're looking for? Browse other questions tagged harry-potter magical-creatures the-cursed-child or ask your own question. Could Hermione change her skin colour?